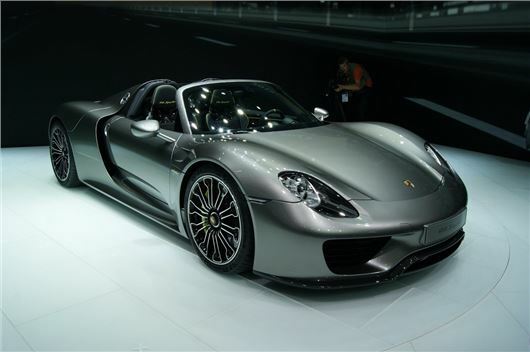 Porsche has unveiled the production ready version of its 918 Spyder hybrid at the 2013 Frankfurt Motor Show. Described by Porsche as the “sports car for the future”, the 918 will be powered by a plug-in hybrid system that will offer an impressive 906PS and a top speed of 214mph. The hybrid system works by combining a race-tuned V8 engine with two electric motors, one for each axle, making the 918 a four-wheel drive car. The car can be driven solely by the mid-mounted 616PS V8 engine or by the 290PS electric motors. Combined, the powertrains will propel the Spyder from 0-62mph time of just 2.8 seconds, while returning 94mpg and just 70g/km of CO2. The chassis feature a carbonfibre monocoque, with adaptive dampers, rear-wheel steering and carbon-ceramic brakes. The power will be delivered via a seven-speed twin-clutch PDK gearbox. There are five difference driving modes, which range from full electric to race hybrid. The 918 will cover 20 miles in electric mode, but still be capable of reaching a top speed of 93mph. The car will also have a ‘hot lap’ mode, which will squeeze all available energy from the battery to produce a single burst of performance. It might fall into a free VED band but the car itself is to cost more than £600,000 when it comes on sale from October.